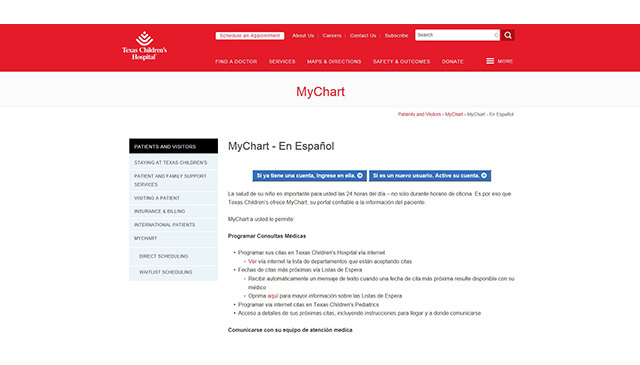 As part of Texas Children’s Care Coordination Initiative – and in an effort to ensure better care and communication between providers and their patients – MyChart is now available in Spanish. Before or after patients log on to MyChart at mychart.texaschildrens.org, they can click on the “En Español” button and the MyChart patient portal switches to Spanish. From there, patient families can obtain their after visit summaries and immunization records electronically, reducing phone calls and delays. They can also request medication refills and other services. All of the main features from MyChart English are now in Spanish except for certain titles or sections, such as medication names. Within MyChart, patient and families can also send and receive open messages. Care team members have three tools to translate Spanish messages from MyChart. Messages can be translated by Spanish-speaking staff who have been validated by Language Services or through a translation software, Systran. Staff can also send MyChart messages for translation to the Language Services team via Epic Inbasket. Each clinic has established their workflow on who and how incoming messages will be translated and can then respond to the concern or request using the current workflow for English messages. From Texas Children’s operations teams that provided the guidance for needed features to the technical teams that helped implement the new functionality to the Language Services department that provided translations for content, the MyChart Spanish rollout has been a huge team effort across the board. Language Services provided all of the content and document translations that populated the server files for the Spanish MyChart implementation. This included everything from minor phrases and alert messages to full multi-page, terms of service and important FAQ translations. All of the patient-facing files and content needed to be translated and included in the Spanish MyChart build on the web servers. The soft launch of MyChart Spanish will give staff the opportunity to test the system and workflow processes before actively marketing this new service to our Spanish-speaking patients and families. Click here to read the MyChart Spanish FAQs. For more information about MyChart, visit texaschildrens.org/mychart.